The sports car is a symbol of youth, freedom, and vitality embodied by three elements – visual appeal, innovative engineering, and superior performance. When an automaker gets the recipe just right, the result is a car that preys on our emotions, lingers in our thoughts, and leaves us consumed by an unrest that is only quelled by slipping into the driver’s seat. In this incredible XK 140, William Lyons got it right. Founded as the Swallow Sidecar Company in 1922, the SS Jaguar name first appeared on a 2.5-litre saloon in 1935. 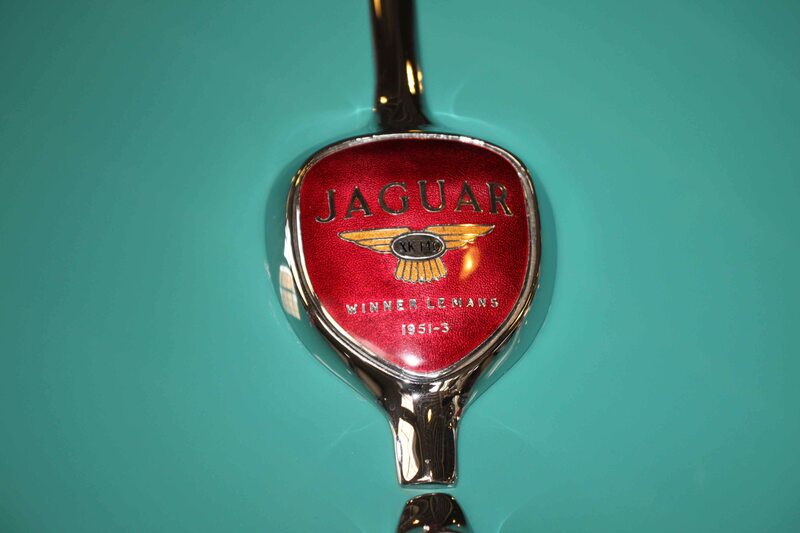 The Jaguar name was given to the entire company in 1945. The early 50’s XK-120 was the perfect post-war sports car, at least from a British point of view—simple, adequately powerful, and absolutely beautiful. The Brits weren’t alone on this. Almost from the moment the car appeared at the Earls Court Motor Show, it became one of the most sought-after automobiles in the world. The updated Jaguar XK140 was manufactured between 1954 and 1957. 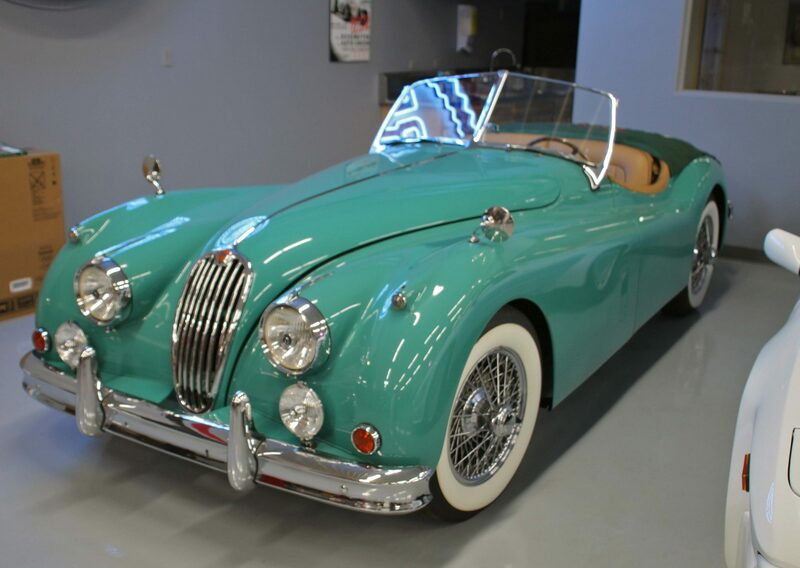 Upgrades over the XK120 included better brakes, rack-and-pinion steering, and modern tube type shock absorbers instead of the older lever arm design. 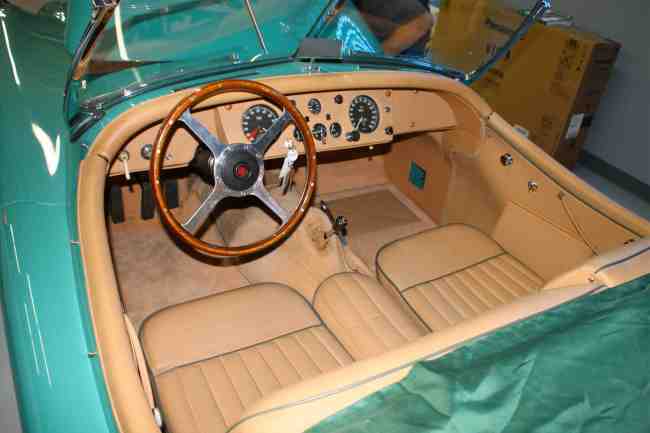 The engine was moved three inches forward in the engine bay allowing more interior room for the driver and passenger. Handling was also improved by this three-inch difference. The primary visual change of the XK140 over the previous XK120 was the more substantial front and rear bumpers, and chrome accent trim on hood and trunk. The center of the trunk lid has a red shield celebrating ‘Winner LeMans 1951-3’ inscribed in gold. This XK140 features a 3.4-liter straight six, dual overhead cams, C-Type vales and heads, and twin 2-inch SU carburetors, delivering 210 horsepower at 5750 rpm. The engine was built with steel, rather than cast-iron, main bearings which helped in coping with the increase in horsepower. The transmission was given closer gear ratios, which made significant benefits for the driver. An eight-blade fan and larger radiator were adapted to help keep the engine cool. The example we photographed in Auburn, Indiana is a highly correct XK 140, equipped from the factory with optional Laycock de Normanville overdrive, which was installed in only 550 XK 140’s at the factory. 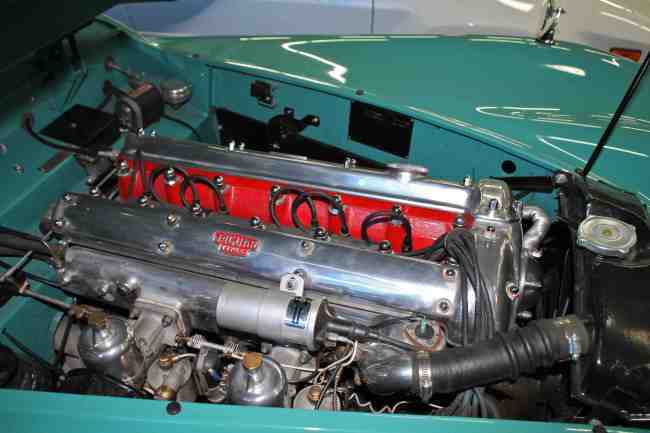 This example also features the ‘MC’ Package that includes a C-Type cylinder head, dual exhaust, fog lamps and wire wheels, among other features. The XK legacy was built on racing results, and Jaguar was dominant with outright victories at LeMans in 1953, 1955, 1956 and 1957. Wonderfully restored in the correct Arbor Green livery, the car has an outstanding new tan leather interior, excellent chrome, and is cosmetically an exceptionally strong example. It’s completely stock, with the exception of disc brakes installed, and presents today as striking as the day it left the factory. XK 140’s are fast, beautiful, and a blue-chip investment vehicle that every car guy should own at some point in his life. If you have an early model Jaguar motor car or another collectible you’d like to insure with us, let us show you how we are more than just another collector vehicle insurance company. We want to protect your passion! Click below for an online quote, or give us a call at 800.678.5173.